On 15 September 2018, a representative of the Initiative for the Resurgence of Abolitionism in Mauritania (IRA-Mauritania) to the UNPO General Assembly, Mr Mohameden Dah, raised awareness of the gross human rights violations experienced by the Haratin in Mauritania, where 1 to 20 percent of the population exists as de facto slaves. 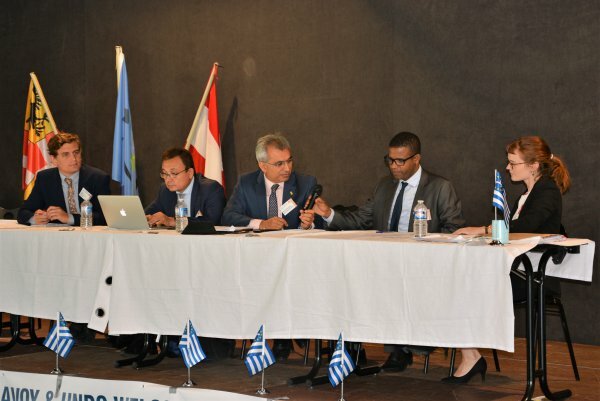 Mr Dah brought special attention to President of IRA-Mauritania, Mr Biram Dah Abeid, and member of the same movement, Husseyn Messaoud, who have been arbitrarily detained for their abolitionist work. The UNPO General Assembly adopted the resolution, calling for the immediate and unconditional release of the two prisoners of conscience. The English and French versions of the resolution are available below. Expresses its strong preoccupation in the face of the arbitrary detention, since 7 August 2018, of President of the Initiative for the Resurgence of Abolitionism in Mauritania (IRA-Mauritania) Mr Biram Dah Abaid, elected deputy in his country on September 2018, as well as Mr Abdalah Husseyn Messaoud, member of the same movement. Calls upon the Mauritanian authorities to immediately and unconditionally free the two prisoners of conscience. To take a look at the Haratin resolution, click here. Exprime sa vive préoccupation face à la détention arbitraire, depuis le 7 août 2018, du Président de l’Initiative pour la Résurgence du Mouvement abolitionniste en Mauritanie (IRA-Mauritanie), Monsieur Biram Dah Abeid, élu député dans son pays le 1er septembre 2018, ainsi que de Monsieur Abdalah Husseyn Messaoud, membre du même mouvement. Lance un appel aux autorités mauritaniennes afin qu’elles libèrent immédiatement et sans conditions les deux détenus d’opinion. Pour accéder à la résolution de l'UNPO sur les Haratin, cliquez ici.